Our goal is to raise our collective voice in support of the aging population in New Hampshire, promoting a strong, stable infrastructure for healthy aging. The New Hampshire Alliance for Healthy Aging identified six domains as the focus of our collective impact initiative to promote a strong, stable infrastructure for healthy aging. These domains include Living Arrangements, Family Caregivers, Social and Civic Engagement, Physical and Mental Well-being, Advocacy, and Fundamental Needs. Building on the momentum of the strategic priority workgroups, we established a measurement framework to monitor performance and track progress to achieve our shared vision. To best assess NH AHA’s impact on supporting older people in New Hampshire, our measurement framework focuses on both process and outcome strategies. Process Strategy: Process indicators are used to identify and track short-term goals for each of the strategic priority workgroups. Progress on the 2017 Process Goals for each strategic priority workgroup is summarized in this PDF. Outcome Strategy: The six domain areas of NH AHA’s shared vision is the framework for measuring our long-term success. We scanned for consistent and reliable data sources relevant to each domain area, such as the U.S. Census and Community Health Survey, however many data gaps exist. Measuring social determinants of health from a person-centered perspective, a key aspect of the AHA shared vision, is gaining traction as the awareness of social aspects of health increases. Currently, there are limited data sources that take this approach. AHA will continue to address the gaps in our outcome measurement strategy as sources become available. Click on the domain and general measures in the wheel below to review the AHA outcome measures. These resources are for individuals interested in exploring and understanding their community’s older adult health and wellness status, or perhaps launching an age-friendly initiative or program in their community. NH Healthy Aging Data Report is designed to provide health information about older people on a statewide and community level: Release planned for early 2019. 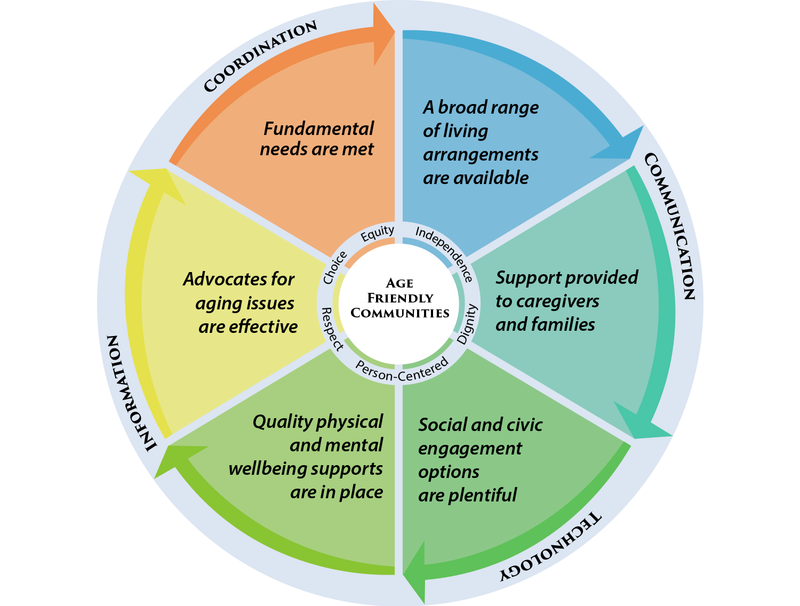 Tri-State Learning Collaborative on Aging offers tools and resources to build sustainable age-friendly initiatives, including assessment and measurement tools. NH Health WISDOM provides interactive dashboards to measure health, health risks, and health outcomes illustrating the well-being of NH and our communities. Medicaid Quality Information System offers a wide range of measures, reports, and related resources for Medicaid and other DHHS program data. NH Health Data Inventory provides information about health data sources and reports. 100 Million Healthier Lives includes a menu of measures to support communities evaluating their local initiatives, specific common measures, instruments, and scoring guidance to assess progress towards achieving the goal of 100 million people living healthier lives by 2020. AARP Research: Data and Tools include datasets, tools, and visualizations. The NH Alliance for Healthy Aging (NH AHA) is a statewide coalition of stakeholders focused on the health and well-being of older adults in New Hampshire. NH AHA works to promote its shared vision to create communities in New Hampshire that advance culture, policies and services which support older adults and their families.